In this game players compete to find magical artifacts from an ancient maze. The maze is enchanted and players can change its layout using only their minds. This way they can help themselves in their search or hinder their opponents. Coins placed number up on the maze represent either monsters (stronger the bigger the number on the coin) or artifacts (if the suit, revealed only to the player that lands there, matches the player's suit). First player to find 3 artifacts and exit the maze wins. 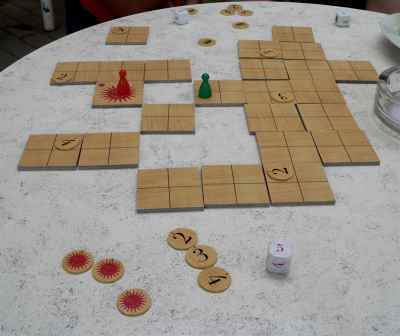 This game was designed to be played with a piecepack set and a pentominos set. The pentomino pieces are the walls for the maze. It gives a nice 3D feel to the game (each square section of the pentomino pieces has to be of the same approximate size as the small squares from the piecepack tiles). If you don't have a pentominos set, there's an alternative mechanic, although it changes the game a bit. After a few more plays with the pentomino set I've decided to update the rules. Basically I've added the possibility of "stealing" a wall from another player so a player can't permanently block another player or a treasure. But a player who takes advantage of this rule must move that wall on their next turn. I've also updated the way walls are created with a pentomino set. Basically, pieces have to be totally inside the board and not all the 12 pieces are used in a game. Three are left out of play so the maze is not too crowded. 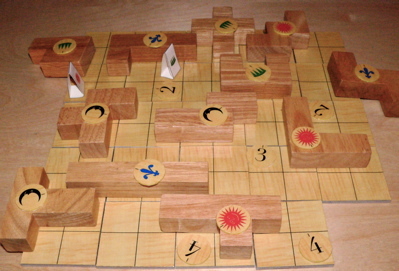 A three player game in progress. My 6yo son playing green eventually won with me on a close second. This is from an older set of rules, but it's almost the same except for how the coins are set on the walls and the fact pentomino pieces have to fit inside the board. This game is actually my second game (it predates SpaceTraders but I hadn't written the rules down until recently) and has been tested a lot with 2 players. I think it works quite well for a short filler.